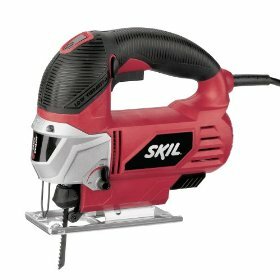 Skil power tools have been a middle class man's best buy for a long time now. A fierce rival for giving optimal machinery at subsidized rates, Skil tools mainly manufacture light & mid-duty jigsaws leaving professionals with acutely restricted or rather no options. Jigsaws are the best tools for carving, chiselling & cutting intricate patterns on wood & other materials. However, Skil jigsaws have launched the most number of jigsaw model series, catering to almost all the consumer demands. The 4000 series have the largest number of model choices. A special feature of a few Skil 4000 series jigsaws is the presence of a small rotary at the very top of the tool. This allows to the blade to be moved or rotated while the cut is being done. Some of these models also have a "scroll knob" which is a great help while doing straight cuts. Though easy blade change mechanisms & a vigorous dust blower offer nothing new, they help the cutting process. Apart from the normal features that any jigsaw would have (like good durability, power, versatility of blades etc), These jigsaws have an effortlessly manipulative operation mode & well labelled switches that are easily accessible. Even lower end models of jigsaws by Skil come with a dust port & a chip deflector which prove to be really useful. The locking trigger system is an added advantage as the user can rest for a while during a long cut. The Skil 3000 & 7000 series are the latest launches & their pros & cons cannot be debated as yet. These jigsaws lack stability. Most of the times, it is very tiring to get a cut straight without much effort. While cutting the curves, the jigsaw is unable to maintain the set angle till the cut is complete. Since Skil makes only light duty & mid-duty saws, the spring snaps even when it is unexpectedly subjected to the least bit of exertion. Though the adjustment mechanisms in these jigsaws are easy to execute, it's not tough enough to withstand rough & constant handling. Skil 4000 series jigsaws have a very big trigger which intrudes with the hand space on the machine given to hold the jigsaw comfortably in position. It can accidentally turn on the machine which could be hazardous when unexpected. Another major drawback of the Skil jigsaw 4000 series is the slow speed with which the apparatus must be handled for a clean, clear-cut finish, retarding progress & making the user impatient. The bases of all the jigsaws by Skil are small, which makes the instrument topple over if not held or positioned properly. The blades of the jigsaw loosen themselves & fall out eventually when it is continuously being used. In some of these jigsaw models a very large portion of the blade is exposed, making it dangerous to handle at even considerably high speeds. In spite of being heavy & solid, many of the cheaper Skil jigsaw models vibrate pretty intensely. These jigsaws can surely satisfy consumers who love changing their tools often!! Return From Skil Jigsaws Page to Home - Finishcarpentryhelp.com.